Baintha Brakk (Urdu: بائنتھا براک‎) or The Ogre is a steep, craggy mountain, 7,285 metres (23,901 ft) high, in the Panmah Muztagh, a subrange of the Karakoram mountain range. It is located in Gilgit-Baltistan, Pakistan. It is famous for being one of the hardest peaks in the world to climb: twenty-four years elapsed between the first ascent in 1977 and the second in 2001. Baintha Brakk is exceptional in its combination of altitude, height above local terrain, and steepness. It is a complex granite tower, steeper and rockier than most other Karakoram peaks. (The Latok peaks next to Baintha Brakk are similar, however.) For example, its South Face rises over 3,000 metres (9,800 ft) above the Uzun Brakk Glacier in only 2 km (1.24 mi) of horizontal distance. The second ascent of Baintha Brakk was made by Urs Stöcker, Iwan Wolf, and Thomas Huber, on 21 July 2001, via the South Pillar route, following their first ascent of the subsidiary peak Ogre III (circa 6,800 metres [ 22,300 ft ]). They note that there were more than 20 unsuccessful expeditions in the interim. Mountain INFO magazine characterized their ascent as "arguably the most notable mountaineering achievement during the entire 2001 season." A third ascent by a new line on the peak's South Face was made by Americans Kyle Dempster and Hayden Kennedy on August 21, 2012. Compatriot Josh Wharton had also accompanied them on the climb but had to abandon the attempt at approximately 6800 meters (approximately 22,310 feet) due to altitude sickness. Earlier in their trip the two had made another first ascent (along with Slovenian Urban Novak) of a new line on the massive east face of K7 (6,934 meters, 22,749 feet). ^ "Karakoram ultra-prominent peaks". peaklist.org. Retrieved 2013-07-27. 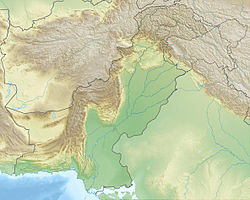 ^ This region is disputed, and is claimed by India to be an integral part of the Indian state of Jammu and Kashmir. ^ Orographical Sketch Map of the Karakoram by Jerzy Wala, 1990. Published by the Swiss Foundation for Alpine Research. ^ a b Andy Fanshawe and Stephen Venables, Himalaya Alpine-Style, Hodder and Stoughton, 1995, ISBN 0-340-64931-3. ^ The Himalayan Index lists only ten unsuccessful attempts; however the index is often incomplete. Its entry for the Ogre also mistakenly lists the second ascent as occurring in 2000. Jill Neate, High Asia: An Illustrated History of the 7000 Metre Peaks, ISBN 0-89886-238-8.